Now if you run this code the result will be identical to the previous run, the only difference is in the internal code. Instead of creating a wx.Frame directly we create an instance of our wx.Frame derived class wxHelloFrame. wxHelloFrame does nothing except initialize its parent class and then call the create_controls() function which is where we will create our widgets in the future but for now does nothing. wx.Sizer is the abstract base class used for laying out subwindows in a window. You cannot use wx.Sizer directly; instead, you will have to use one of the sizer classes derived from it such as wx.BoxSizer, wx.StaticBoxSizer, wx.GridSizer, wx.FlexGridSizer and wx.GridBagSizer. 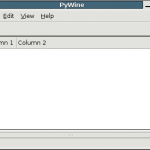 The concept implemented by sizers in wxWidgets is closely related to layout tools in other GUI toolkits, such as Java’s AWT, the GTK toolkit or the Qt toolkit. It is based upon the idea of the individual subwindows reporting their minimal required size and their ability to get stretched if the size of the parent window has changed. This will most often mean that the programmer does not set the original size of a dialog in the beginning, rather the dialog will assigned a sizer and this sizer will be queried about the recommended size. The sizer in turn will query its children, which can be normal windows or contorls, empty space or other sizers, so that a hierarchy of sizers can be constructed. Note that wxSizer does not derive from wxWindow and thus do not interfere with tab ordering and requires very little resources compared to a real window on screen. The basic idea behind a box sizer is that windows will most often be laid out in rather simple basic geometry, typically in a row or a column or nested hierarchies of either. A wx.BoxSizer will lay out its items in a simple row or column, depending on the orientation parameter passed to the constructor. It is the unique feature of a box sizer, that it can grow in both directions (height and width) but can distribute its growth in the main direction (horizontal for a row) unevenly among its children. This is determined by the proportion parameter give to items when they are added to the sizer. It is interpreted as a weight factor, i.e. it can be zero, indicating that the window may not be resized at all, or above zero. If several windows have a value above zero, the value is interpreted relative to the sum of all weight factors of the sizer, so when adding two windows with a value of 1, they will both get resized equally and each will receive half of the available space after the fixed size items have been sized. If the items have unequal proportion settings then they will receive a coresondingly unequal allotment of the free space. Whew, that’s a lot of documentation, fortunately wx.Sizer’s aren’t that difficult to use. So first we need to create a horizontal wx.BoxSizer (so that our widgets will resize horizontally) and then add wx.StaticText and wx.TextCtrl widgets to the sizer. After that we simply need to set the wx.boxSizer as the frame’s sizer and we are done. So, as you can see creating the wx.BoxSize and the wx.StaticText widgets is pretty straightforward. When we create the wx.TextCtrl widget you’ll notice that we are setting the default size of the widget using a wx.Size object. We are setting the default width to be 250 and the default height to be -1. When you use -1 as the value for a parameter in wxWidgets it generally means that that parameter should be ignored. So since we don’t want to set the height of the edit field, we want wxWidgets to do that for us automatically, we set the height to be -1. You’ll also notice that the first parameter when we created the wx.StaticText and wx.TextCtrl widgets is self, or our wxHelloFrame. This means that the wxHelloFrame will be the parent window of the widgets. We then add the two widgets to the wx.BoxSizer using the wx.Sizer.Add function. When we add the wx.Statictext we set the resize proportion to be 0 since we don’t want it to resize, and when we add the wx.TextCtrl we set its resize proportion to be 1, since we want it to resize directly with the window as it resizes. You’ll also notice that we add a spacer in in between the wx.StaticText and wx.TextCtrl widgets using the wx.Sizer.AddSpacer() function. We do this to add a 5 pixel horizontal buffer between the two widgets just so that things look nicer. So that’s pretty neat, you have a window with some widgets that resize. The next thing that we are going to do is add a wx.Button underneath the wx.StaticText widget. To do this we will need to use another wx.BoxSizer, this one being a vertical sizer. Then we will add our horizontal wx.BoxSizer to the vertical sizer and then add the button. This will place the contents of the horizontal box sizer over top of the button. The item will be expanded to fill the space allotted to the item. One thing that you will notice when you run the program is that the window starts off too big for the widgets and you can resize the window smaller then the size of the widgets. This isn’t very nice so we need to add in some code to set the initial size of the window and to set the minimum size of the window. The other thing that we need to do is do something when the button is clicked. We will make it so that when the button is clicked a message box comes up displaying whatever text was typed in the wx.TextCtrl. We simply call the wx.Button.Bind() function, bind it to the wx.EVT_BUTTON event, and tell it what function of ours to call when the button is pressed. To size the frame to the sizer we call the wx.Sizer.Fit() function. We then set the minimum size of the frame using the wx.Frame.SetMinSize() function to the minimum size of the vertical sizer which we get using the ws.Sizer.GetWinSize() function. wx.OK – Show an OK button. wx.ICON_EXCLAMATION – Shows an exclamation mark icon. wx.CENTER – Is supposed to center the dialog on it’s parent. 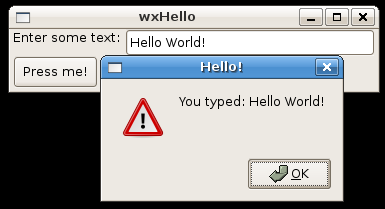 Then we show the dialog using the wx.Dialog.ShowModal() function. So that’s it for this simple wxWidgets tutorial I hope everything makes sense. All-in-all I found my first experience with wxPython to be quite enjoyable, I would have liked the wxPython documentation to be a bit more robust but using it and some of the other examples on the Internet was enough for me to muddle my way through. I still think that I prefer pyGTK to wxPython but the fact that I have more experience with pyGTK probably plays a large role in that. I also like that the fact the pyGTk seems to take a different approach to the other GUI tool kits that I have used making it able to do some really neat things. wxWidgets on the other hand seems to be more similar to other toolkits, which made me instantly more familiar with some of its functionality. As always if you have any questions or comments, or if you notice any bugs or style irregularities feel free to add a comment below. If you have any of your own wxPython tips or want to ask some wxPython questions why don’t you do so in the learningPython fourms? Now it’s time for a glass of wine! Thanks for the article, also liked your one on PyGTK. I’m more of the wxPython fan myself. I’ve found it has a very active user community with lots of open source widgets. A plus when it comes to making all sorts of fancy programs with minimal effort. I have not looked into the packaging of a wxPython application all that much. I did stumble upon a short py2exe tutorial on the wxPython website. For OSX you you might want to read this Optimizing for Mac OS X from the wxPython site. 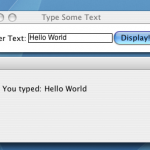 It describes using py2app to create stand-alone applications for OSX. If you’ve learn anything more about this I’d love to hear about it. Thanks for the kind words! I still think that I like working with PyGTK a bit more, however I really can see positives on both sides. Good advice, thanks for the tips. I just found this article from http://wiki.wxpython.org/FrontPage. This was the best presentation on sizers that I have read. Your examples made it very easy to understand a concept that was so difficult for me before. Thank you very much! comprehensive wxwidgets documention. that is really bottom-up. Thanks that was really useful. Do you have any guidance on setting up event handlers in wxWidgets? Thanks for taking the time to share your knowledge, the article it very good! Thank you for this great tutorial. I already had some experience with PyGTK and now I want to familiarize me with wxPython to start developing a bit for Mac OSX. Your tutorial helped me a lot to understand the “basic wxPython”. “Now we are going to start adding the widgets to the frame in the create_controls() function”. “Now we are going to start adding the widgets to the application by modifying the create_controls() function defined in the wxHelloFrame class. I know this is being very, very picky, but I have seen people define a second create_controls function outside of the class definition and get very frustrated. I hope you are not irritated by this observation. add it into an existing script. It answered some questions I had about using a dialog. Now, I won’t be so slow to add them in when needed. I know this site provides quality depending articles and additional material, is there any other website which provides these data in quality? The formatting of this page is messed up. Some of the text overlaps other text and makes the page unreadable. Hi, if you unzip the template and lucanh main.py (not MainFrame.py) the program should run without any modification. If the program works try to change the code inside the event handlers and lucanh it again. Launch main.py from the console, so you can see the traceback in case of errors. 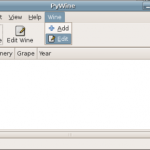 When the application is finished and debugged, rename main.py to main.pyw to execute the application without the console. a page for them. They also tend to be searched more unlike others in subsequent pages. write about but clueless on how to address it. Previous Previous post: Forums Forums Forums!